A photomicrograph of Salmonella bacteria. Courtesy of Pacific Northwest National Laboratory. Salmonella, what's gotten into you? Researchers have been asking themselves this question ever since Salmonella bacteria grown on board the space shuttle returned to Earth 3 to 7 times more virulent than Salmonella grown on the ground under otherwise identical conditions. Figuring out why could help safeguard astronauts from disease and lead to new treatments for food poisoning and other common ailments on Earth. New research by Cheryl Nickerson (Arizona State University) and colleagues explains not only why Salmonella gets "revved up" in space, but also how to calm it down again. "We think space travel tricks Salmonella into behaving as if it is in the human gut," Nickerson says. "It's a mechanical phenomenon having to do with 'fluid shear.'" Salmonella microbes have the ability to sense the force of fluid moving past their outer surfaces. This "fluid shear" acts as a signal to the microbe, helping it to know where in the human body it's located. Salmonella usually enters the body by hitching a ride on food that a person eats. In the middle of the tube-shaped intestines, the liquid-like mixture of half-digested food and digestive juices churns around quite a bit, so the amount of fluid shear is high. But as a Salmonella cell approaches the wall of the intestines, it slips into the tiny spaces between microscopic, hair-like protrusions called microvilli that cover the intestinal lining. There, the cell becomes sheltered from the churning motion, and fluid shear drops to very low levels. And it's there that the bacterial cell can cross from the intestines into the bloodstream to start an infection. 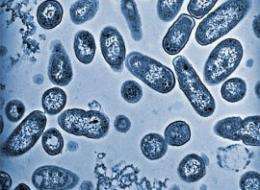 So it would make sense for a bacterium experiencing low fluid shear to alter the activity of genes that help the bacterium survive and cause infection. NASA astronaut Heidemarie Stefanyshyn-Piper activates a Salmonella experiment during space shuttle mission STS-115. Computer-based simulations have shown that the amount of fluid shear experienced by bacteria in the weightless environment of orbit is similar to the amount in these tiny spaces at the intestinal wall, Nickerson says. "Space flight is a low fluid shear environment." Nickerson's team looked at Salmonella from two shuttle flights to the International Space Station: STS-115 in Sept. 2006 and STS-123 in March 2008. They found that 167 genes were either more or less active in these keyed-up bacteria than in the bacteria that hadn't flown. The team also identified a "master switch" that regulates about one-third of these genes, a protein called Hfq. Activity of this protein was also affected by the low fluid shear conditions of spaceflight. Now that scientists know which genes and proteins help create this virulence-boosting effect, they are working to use this information to develop new strategies to combat Salmonella food-borne illness, such as vaccines and therapeutics. The team has already found one promising way to combat Salmonella's extra virulence: add a dash of ions. When Nickerson and her colleagues grew the same strain of bacteria in a culture medium that contained higher concentrations of five ions -- potassium, chloride, sulfate, magnesium, and phosphate -- the virulence of the bacteria due to spaceflight no longer went up! "Cells are funny things," Nickerson says. "If you give them too much or too little of something they're used to having around, they'll surprise you with how they respond." As it turns out, many of the genes activated by the low fluid shear environment of spaceflight are involved in transporting these ions in and out of the cells, so there could be a connection. Research on this ion effect is still ongoing, Nickerson says, but she speculates that it could eventually lead to new ways to use these ions to ward off Salmonella infections. "One question people ask me is, 'Why in the world did you think of looking at [Salmonella in space]?' I turn that around and ask, 'Why would you not think of it!'" Nickerson says. "Whenever scientists have studied microbes under extreme conditions, we have found amazing new insights into how they function. Space flight is another extreme environment that's relatively untapped." "To me it was a no-brainer."